Such a speed would be more than 20,000 times faster than today’s top 4G wireless networks and about 20 times faster than the U.S.’ speediest home internet services. A terabit is 1 trillion bits of information. A 1 terabit-per-second signal could simultaneously stream about 200,000 high-definition movies. 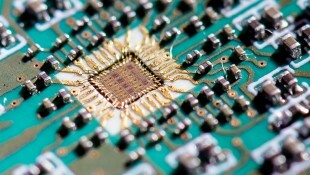 “Breaking the terabit-per-second barrier with radio will enable an entirely new set of wireless applications and communication paradigms,” said Edward Knightly, professor and chair of Rice’s Department of Electrical and Computer Engineering and principal investigator on a new $1.3 million, three-year grant from the National Science Foundation (NSF) to develop terabit wireless technology. The need for such speed is indicated by a 2016 Cisco study that found global mobile data traffic grew by 74 percent in 2015, rising to 3.7 exabytes (almost 30 million terabits) per month in December 2015. The same report found that smartphone data usage grew 43 percent in 2015, with the average user consuming 929 megabytes per month. That was driven in large part by the public’s rapidly growing appetite for watching videos on mobile devices. Cisco found that mobile video accounted for 55 percent of all mobile data traffic in 2015. “Pulse-based technology isn’t new,” Babakhani said. “Marconi first demonstrated it in the early 1900s. He used an antenna connected to a large capacitor. By charging that, he could cause the power to build up until the voltage difference ionized the air gap and caused all the power to be sent to the antenna at once. That was the first pulse-based communication network. He used it to show he could transmit long distances, and it was low-frequency. 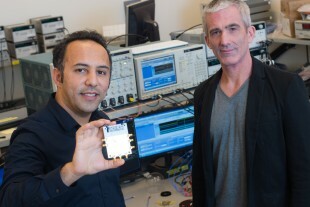 Babakhani’s lab, which set a world record earlier this year for transmitting the shortest radio pulse of 1.9 picoseconds, will develop and fabricate a dinner-plate-sized transmitter that can send even shorter pulses at high frequencies ranging from 100 gigahertz to several terahertz. The transmitter will actually contain about 10,000 individual antennas, each of which is a separate microchip capable of sending out picosecond radio pulses. Babakhani said the number of antennas will boost the signal strength, making it possible to demonstrate the technology over distances up to a quarter mile. In addition, the antenna array also will allow the team to steer the signal with fine accuracy.